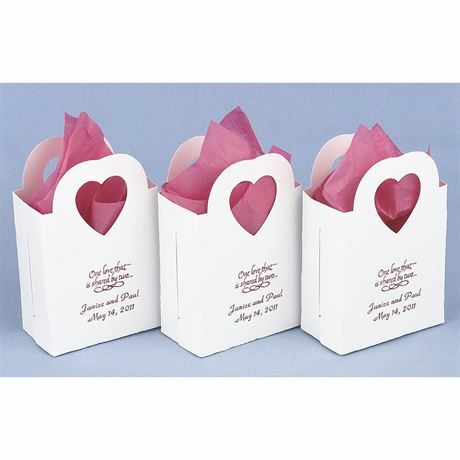 Heart-shaped handles make these white boxes fun favors and keepsakes. Each box is printed with your names and wedding date and choice of design, in a foil color of your choice. Contents not included. It is highly recommended to use wrapped candies or liners when placing food into any type of favor box or container. Size: 3 1/2" x 2 1/4" x 1 1/4"
I am going to use these as favors for my wedding in May. The wording "One Love Shared By Two" is beautiful. The personalized engraving came out great! My fiance is even excited about them! I went with the 2 people with wording which is hard to read, I would go with something simple like the hearts or the date.